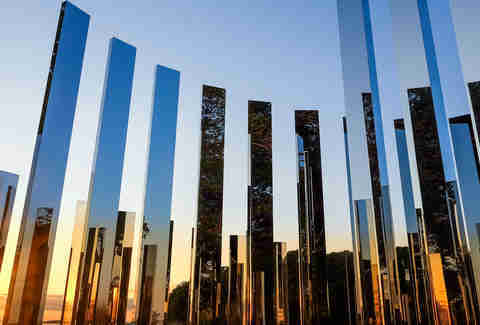 Why spend the day in a gallery when there is so much art to take in outside? From the middle of a city block in Philadelphia to the middle of nowhere in the Great Salt Lake, there’s plenty of culture waiting for you far, far away from the overwhelming crowds shoehorned into the same old popular galleries everyone else flocks to. But not you. Not anymore. 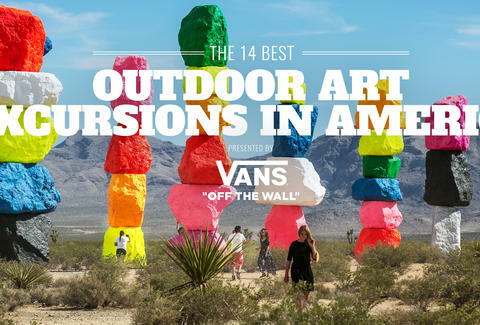 Not after you check out this list of the best outdoor galleries, sculpture exhibits, and street art in America -- just be warned: you may never go inside again. Part psychedelic adventure, part artistic marvel, this mosaic labyrinth covers half a city block in underground passageways and staircases, all constructed from multicolored ceramic shards, as well as truly random knick knacks like bicycle spokes. 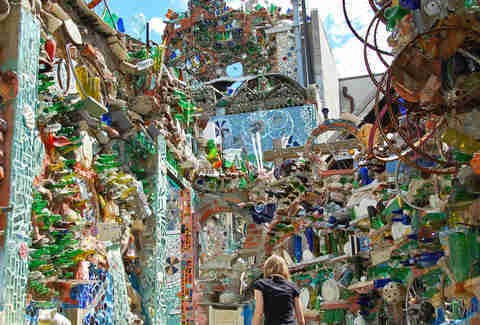 It’s all from the mind of Isaiah Zagar, who has been making vacant storefronts and various other forms of public property a whole lot prettier since the 1960s. He laid the first tile of the Magic Gardens in 1994, on what was then an empty lot next to his South Street studio. That tile is a mix of broken pieces of artwork that were damaged in shipment to the Eye’s Gallery on South Street, which is owned by his wife, Julia Zagar. It’s also from leftover tile donated by the nearby Lowe’s, and the fruits of the artist’s own dumpster diving. You know the saying: one man’s trash is another man’s lifelong artistic endeavor. Impress Your Friends With: There was just one problem when Zagar started Magic Gardens: that lot wasn’t his. 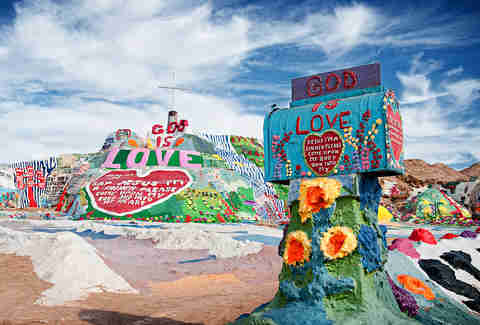 The owner was so not amused that he put the lot up for sale, and promised to demolish Zagar’s hard work. Philadelphians stepped up, however, and helped raise funds for Zagar to buy the site of his masterpiece outright and open it to the public. If a place for everything and everything in its place is more your speed, consider this offshore installation the equivalent of a long meditation session. Located off a peninsula on the northeastern shore of Utah’s Great Salt Lake, the Spiral Jetty is more than six thousand tons of black basalt rocks and earth arranged in a 1,500-foot-long, 15-foot-wide perfect swirl. Its construction in 1970 coincided with a pretty serious drought, so it disappeared for almost 30 years before water levels receded again in 2002. Today, it’s visible almost every day, but be sure to bring extra layers for the occasion; it’s colder on that lake than you’d expect. 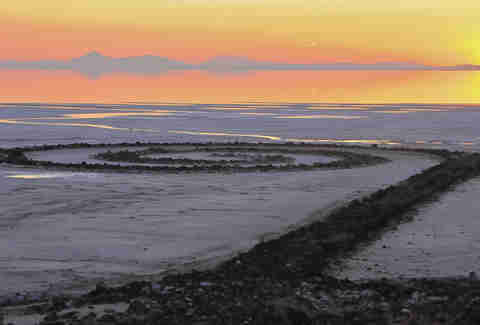 Impress Your Friends With: The Spiral Jetty helped usher in the “land art” movement -- seriously giant works of art formed from the very earth. 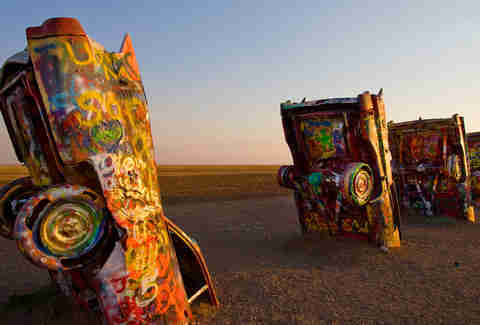 This artwork/roadside attraction, situated on Route 66 right outside of Amarillo, comprises ten classic Cadillacs buried hood-first in the dirt by three hippies from San Francisco. If it reminds you of anything, know that the guys were paying homage to the Great Pyramid of Giza, as well as the iconic Cadillac (ok, that one is way more obvious). The arrangement of models from 1949 through 1963 is far from random, as the guys wanted to emphasizes the rise, and eventual disappearance, of the car’s classic tail fins. And that graffiti was not the artist's’ idea -- the Cadillacs quickly became a target for local taggers. It’s become so iconic that it’s inspired other pieces, like the Airstream Ranch in Florida, and the VW Slug Bug Ranch also off Route 66 in Texas. Impress Your Friends With: The Hampton Inn led an effort to restore the piece to its original colors in the early 2000’s, which lasted a whole 24 hours before it was spray painted again. 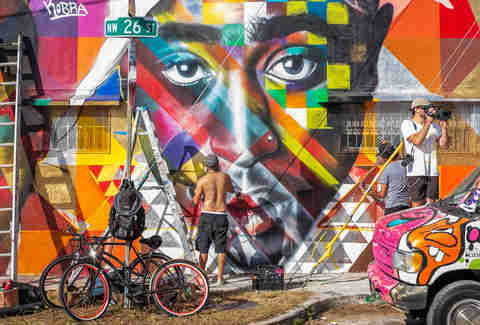 Check out dozens of pieces of street art without sore feet or multiple cab fares at this self-described “Museum of the Streets.” Since 2009, Wynwood Walls’ 80,000 square feet of stark, warehouse building walls have served as ever-changing canvases for 50 street artists from 16 different countries. So kudos to the real estate developer who first looked at this dilapidated section of the Wynwood neighborhood and saw an opportunity for “the greatest street art ever seen in one place.” If you’re feeling inspired, check out the Wynwood-inspired adult coloring book. Impress Your Friends With: Nick Jonas shot a second music video for Chains here and, yes, he gets covered in paint. 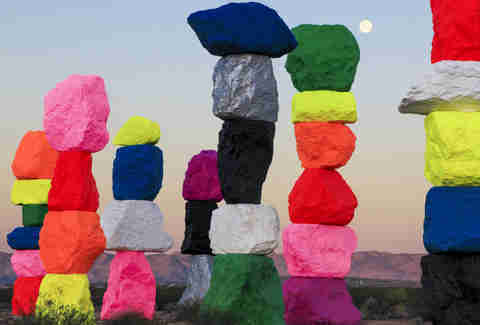 Impress Your Friends With: An estimated 16 million cars will pass Seven Magic Mountains on the highway during its two-year display. If you plan on being one of those people who gets out (and you should), wear closed-toe shoes: rattlesnakes are pretty common in the Mojave. 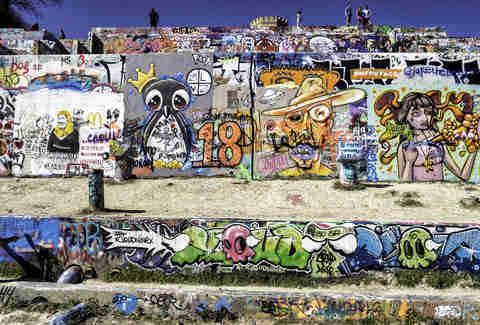 Sure, you can always check out Austin’s street art mainstays, like the iconic “Hi, How Are You?” mural, but for an even deeper dive into the city’s graffiti heritage, hit the HOPE Outdoor Gallery. This community paint park in downtown Austin was established in 2011 as an experiment, and quickly became a local mainstay -- and favorite spot for thousands of selfies. Don’t become too attached to anything on the walls though: the murals and graffiti are constantly changing, and even the largest, most-intricate pieces are subjected to frequent “LISA & JOE 4EVA” tags. Impress Your Friends With: The gallery is on some of the most prime private real estate in Austin. The reason is the views, so hang out at the top of the tallest wall for one of the best glimpse of the skyline. From the mountains to the streets, Vans All Weather MTE collection has got you covered. Built to endure Mother Nature’s harshest weather conditions, this modern technology is designed to keep you warm and dry. Don’t let the rain or snow get in your way, grab your Sk8-Hi MTEs and go explore the outdoors. 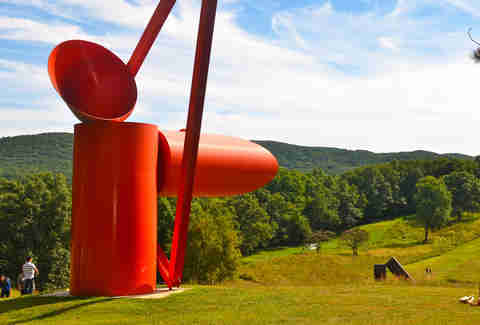 New Yorkers are spoiled for art galleries and museums, yet they still broach the hour-long bus ride from Port Authority (AKA the worst place in Manhattan) to check out -- and rave about -- Hudson Valley’s Storm King. Located on a seriously picturesque 500 acres, this collection of more than 100 sculptures skews abstract, with pieces like Zhang Huan’s Three-Legged Buddha, a 28-foot-high, 12-ton sculpture of a three-legged Buddha precariously balancing on his own head. Impress Your Friends With: The grounds are a work of art all on their own. Late landscape architect William A. Rutherford enhanced the natural environment with fields, wetlands, woods, and plenty more places to get lost in once you make it around all those installations. Impress Your Friends With: The NJ State Fairgrounds site goes back all the way to 1888, when inaugural attractions included a shootout between Annie Oakley and the standing Jersey champ, Miles Johnson. Needless to say, that dude lost, and the 50 live pigeons they released as targets didn’t do so hot either. If you consider keeping your houseplants watered a challenge, give all the props to Topiary Park -- downtown’s “landscape of a painting of a landscape.” Local sculpture artist and landscape architect James T. Mason painstakingly recreated impressionist artist George Seurat’s famous painting A Sunday Afternoon on the Isle of La Grande Jatte (which you might recognize from Ferris Bueller’s Day Off) completely out of green topiaries. Throughout the park are shrubbery versions of 54 people, eight boats, three dogs, a monkey, and a cat, all made out of yew. There’s even a man-made pond that mimics the River Seine. 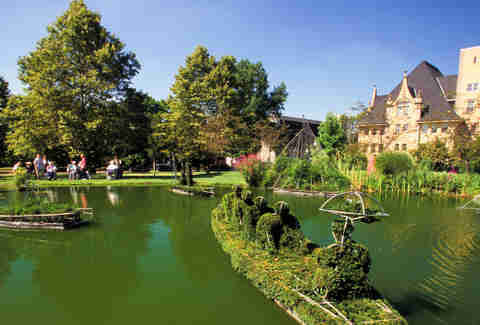 Impress Your Friends With: Topiary Park is the only known topiary representation of a painting in the world. There’s a bronze plaque in the park that marks the spot to stand to take in the topiaries from the same point of view as the Seurat painting, too. Appropriately, it’s shaped like a painter’s easel. 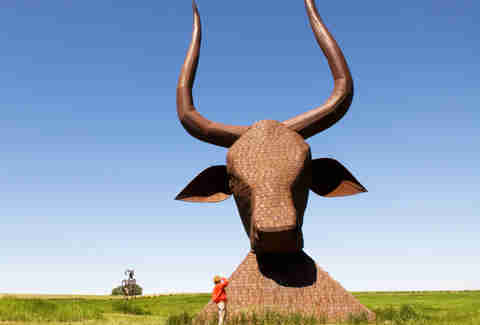 When driving through the flatlands of South Dakota’s 1-90, don’t be startled by the massive 60-foot bull head, situated in the midst of livestock pastures. Wayne Porter’s signature artwork is the same size as the busts carved into Mount Rushmore, and is just one of 50+ gigantic metal sculptures on his 10-acre sheep farm-turned-sculpture park. 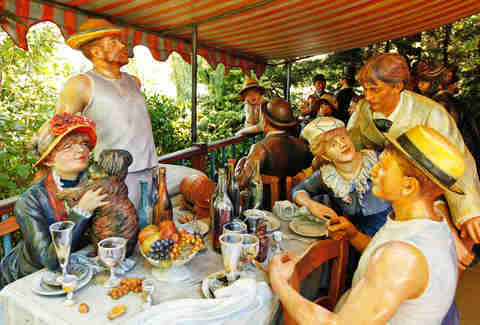 Porter makes them all himself, without sketching, or using engineering principles, or having ever taken an art class. He does use the skills he picked up in his father’s blacksmith shop, though, to turn discarded farm equipment, scrap metal, and even car bumpers into his dragons, jack-in-the-boxes, and macabre creatures. Impress Your Friends With: Porter sold all his sheep to build his Egyptian-style bull’s head -- which you can venture inside of. Its temple-like “innards” contain iron-molded bats and snakes, and a “conference room” at the top where Porter and his family sometimes drink tea. In almost 40 years, the Precita Eyes Muralist Association has created more than 450 murals on schools, parks, and utility boxes across the Mission District, and 80 of them exist for your viewing pleasure within just an eight-block stretch. They started as the work of the Mujeres Muralistas (translation: the women muralists) in the ‘70s, who were inspired by artists like Diego Rivera to represent their own Mexican culture. Today, you can still see murals from 1978, as well as newer commissions, many of which feature heavy community involvement. You might even get to pick up a paintbrush yourself. Impress Your Friends With: For serious oohs and aahs, check out the MaestraPeace Mural on the facade of the Women’s Building on 18th Street. 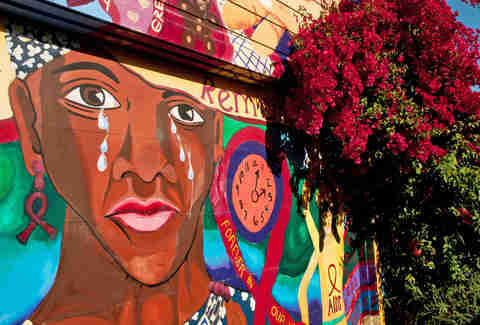 It’s the largest mural in SF, and one of several co-painted by Precita Eyes founder Susan Cervantes. Jeppen Hein, a Berlin-based artist, specifically created New End to compliment the natural landscape of World's End: a peninsula that overlooks the Boston skyline from Boston Harbor. Along the old-school carriage paths and walking trails, you'll find several metal posts at different heights, designed to create a mirrored, reflective labyrinth (so it'll only seem like there's twice as much snowfall this winter). Impress Your Friends With: The World's End site was originally planned as home to the United Nations (before they opted for NYC), then as a site for a nuclear power plant. Thankfully, a group of residents and nearby communities worked together to preserve World's End and its 251-acre coastscape. This 25-foot natural art piece is constructed from the landscape it sits on, just north of Yellowstone in the shadow of the Beartooth Mountains. It was specifically designed for the Tippet Rise Art Center, an art and classical music venue set on an 11,500-acre working ranch. (So don’t be alarmed by the occasional wandering cow). Beartooth Portal is part shelter from the harsh Montana weather (seriously, you should be prepared for not only rain, but also occasional snow from the mountains) as well as an art piece. 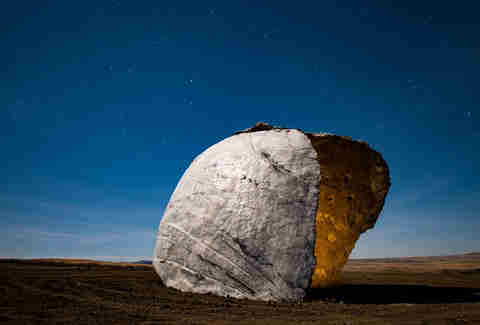 It’s one of three pieces at Tippet Rise from Ensamble Studio. Impress Your Friends With: There are 500 cows at Tippet Rise, 3,000 sheep, but only 8 sculptures. That allows each piece to be fully framed by natural land and sky, and... the occasional four-legged friend.